10.19.09 Ten players gathered to compete in the University of Maine Presque Isle International Chess Tournament on Saturday October 17, 2009. Roger Morin topped this four round G/60 event scoring a perfect 4.0 points. Morin was followed by Roger Hardison and Richard Fontinha with 3.0 points. Ray Haines, Lois Morin and Lance Beloungie each scored 2.0 points to tie for fourth place. Timothy Walker and Joshua Burden shared eighth overall with 1.5 points and Jacob Atcheson and Davis Ng agreed to a last round draw to score 0.5 points for the day. Prizes were distributed as follows: Roger Morin 1st, Jacon Burden 1st Under 1200, David Ng 1st Under 700, Jacob Atcheson 1st Under 500, Lois Morin Top Female. Thanks to Roger Morin and Lance Beloungie for organizing this tournament and to Lois Morin for directing. The road to Presque Isle is a long and solitary trek through some of Maine's most beautiful wilderness. A closer look at the snow-capped summit of Katahdin: Baxter Peak and the Knife's Edge. Potato fields give the landscape a hauntingly beautiful feel. Along Route 1 north of Houlton is the world's largest scale model of the solar system. This diagram shows the locations of each model planet from Pluto (although it has since been stripped of its planetary status) just north of Houlton to the sun on the campus of the University of Maine Presque Isle. The wind farm on the top of Mars Hill as it appears from the north. Now on to chess! Tournament winner Roger Morin went unbeaten and untied scoring a perfect 4.0 points. Tournament Director and women's prize winner Lois Morin makes a move in her first round game vs. Jacob Atcheson. Josh Burden (1146) scored a nice first round win over Ray Haines (1855). Between rounds David Ng takes a break with a little screen time. All prizes--trophies, sets, boards and books were donated by chess philanthropist Darrell Salisbury. Richard Fontinha (standing) and Timothy Walker review their first round game as Lance Beloungie looks on. Joshua Burden (left) and Lance Beloungie enjoy an animated chess-related discussion between rounds in the skittles room. The top four boards going head to head. The Owl's Nest in UMPI's student center provided a splendid venue for tournament chess--looking forward to next year's event! Congratulations and thanks to Lance, Roger, and Lois for their efforts to shine a light on chess in northern Maine. 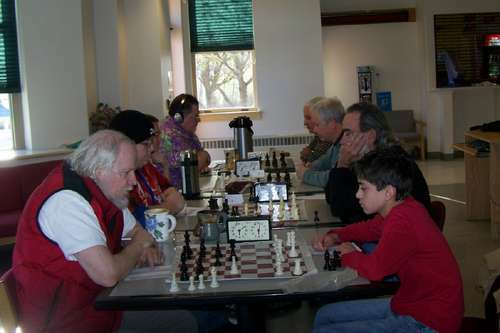 I know from my experiences with scholastic chess that there is a large and active group of players north of Bangor, and it's good to see these efforts to offer USCF tournament action to those loyal players. Keep up the good work!